Kate A. Lebherz-Gelinas is a self-taught illustrator, artist, and craftsman who began working professionally in 1984. 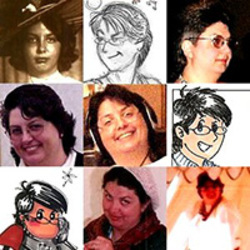 She's done work in advertising, game magazines, game supplements, comics, web cartooning, historic reenactment, and has works in museums and private collections all over the world. While she has an extensive and diverse set of skills and talents, when she's not putting pencil to paper, she spends her time carving crochet hooks, needle felting a variety of fiber, carving gemstones, building scale model terrains, creating dolls, building objects from cardboard, and the list keeps going. Kate resides with her husband "Geo" and their daughter, Sarah amid an extensive collection of books, fossils, mineral specimens, artifacts, computers, and raw materials for her many projects in an old brick house in Fort Valley, GA, that is in and of itself an art project.